I know what you’re thinking. Why am I reading a post about self-care on a website that provides permanent fat cell removal through advanced liposuction techniques? At first glance, it likely feels contradictory and maybe even ironic, but what if I told you that the bulk of our clients who sit in our consult room aren’t pursuing some unrealistic and unattainable beauty ideal? People have this misrepresented notion that the individuals who seek alternatives to their body issues are simply vapid sheep so empty that the slightest of breezes could lift them up and carry them away toward their next egoistic venture. Here’s the thing about this perspective, not only is it completely and offensively fabricated, it diminishes the complexity and the beauty of the human emotional experience. The truth is, we take our bodies with us through every step of this life journey. Our bodies comprise the vessels that enable us to experience the world. One of our first undertakings when born is to find the power of our voice through the symphony that is our lungs and the vibrations of our voice-box manifesting our initial wail post womb. From here, we learn to skillfully coordinate the neuron synapses fired with strategic muscle twitches creating movement. Movement that, in the beginning, simply serves to move us from one place to the other and fosters a sense of independence and autonomy over our lives. This innocent concept of our body’s sole function being movement from one place to another, from one playful activity to another carries us through early childhood. Until one day, almost suddenly, everything changes. We lose the carefree innocence we once possessed about our bodies’ purpose, and we replace it with an endless loop of negative script running on repeat through the ambient noise of our minds. No longer is our body viewed as a counterpart and a sacred partner we carry with us to immerse ourselves fully in the wonder of being. Instead, we brandish it our mortal enemy. Doomed to forever confront the “otherness” it embodies through our constant comparison of it to another. Instead of praising our bodies’ inherent ability to synchronize millions upon millions of individual cell processes to maintain the precise energy needs we require on a moment to moment basis, we diminish our bodies to a set of manufactured mathematical standards that measure our worth as human beings. Inches and pounds become the yardstick for measuring a happy and fulfilled life. And we, especially women, don’t feel like we’ve earned our rightful place in this world until we have whittled our bodies down to perpetual nothingness. Longing to be smaller, to consume less space in a world wherein our words and thoughts are viewed as threatening. Maybe, if we manage to confine ourselves to the smallest amount of physical space possible, we will no longer be perceived as powerful, or more importantly, dangerous. Fraught with failure to achieve society’s stringent standards for our weight and how our body should present itself to the world, we lose our sense of purpose and our compass for true emotional satisfaction. The irony is not that this article attempts to connect liposuction and self-care in a way that feels authentic and obliterates the typical vanity veil shrouding these types of procedures…no, the irony is that true emptiness is borne out of the unrealistic and unfair standards imprisoning us in our bodies. The individuals sitting down in a consult for our HD Body Sculpting procedure are some of the bravest people I know. Instead of accepting the insignificant title they’re branded when their body fails to meet the impossible criteria espoused by media and advertising, or not allowing their fear of unacceptance and being labeled “vain” when pursuing a path they feel will guide them to better health halt their efforts, they show up anyway. Courageous enough to take the action they know will lead to self-betterment. To self-care. Despite others’ opinions of how body empowerment should look. At its essence, self-care means just that: caring for one’s self. Using whatever avenue is needed to provide a launchpad for living a happy, healthy, and more fulfilled existence. And the measures for true self-care achievement happen irrespective of another’s opinion. Our clients innately understand this. Or, even if they don’t recognize the courage they display by overriding whatever shame signals they experience stepping into our clinic and muffling their fears of judgment in favor of self-empowerment, they know that our bodies are so much more than fat and flesh. Our bodies are living organisms designed to prevail and adapt to ever-changing external influences. People visit our offices for every kind of body situation you can possibly imagine: hormonal fluctuations that create fat distribution, prominent C-section scars, diminished breast volume, unexplained pockets of fat immune to traditional diet and exercise methods, weight gain from abusive relationships, and a whole multitude of other deeply personal and deeply emotional issues. None of these situations elicit a “vain” response in my brain. In fact, quite the opposite. Our clients seek healing from the real-life obstacles they travail on a daily basis. What could be more self-care focused than that? Maybe it’s time we stop reducing people to the amount of space their bodies consume and start praising them for mustering the courage it requires to actualize real change. Want to know how you can take the first step to self-care through permanent fat loss? Book your free consultation, today! Why don’t you give us an idea of how much your procedures cost? That is all I really want to know. If it is too much, then I will have to learn to be happy being fluffy. I am at that point where I have tried dieting…mostly cutting back on how much I eat, but it doesn’t seem to do any good lately where it once helped. Maybe I am just too old and I need to just learn to live with it and buy larger clothing. So, give me some prices, please. Hi Sandra! Thanks for your comment. I know it’s frustrating to not have pricing listed, but we do that simply because it’s difficult to assess and quote pricing without being able to see your body. Each body is different and our free consultations involve our treatment coordinator assessing each body and the areas of concern so she can quote you accurate pricing. On average, the treatment costs about $1500/area. Your story is similar to many of our clients. 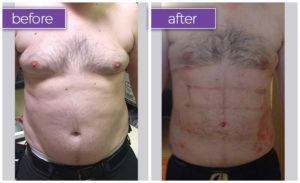 Our procedure works really well for individuals whose bodies aren’t responding to diet and exercise. Our equipment removes fat cells so that “pockets of fat” can be eliminated. Would you like for me to get you a free consultation booked so that you can determine if this procedure is the right one for your needs?